Devon Square wanted to become a more dementia friendly GP surgery. Mike Stewart, Practice Manager and myself, Patient Participation representative, requested a Dementia Walkthrough. Liam McGrath, Alzheimer’s Society, visited on 20th April 2017 with his Dementia Leadership Group. Five very enthusiastic and cheerful people living with dementia who willingly give up their time to complete these Walkthroughs. Things which might challenge a person living with dementia were highlighted. Positives were also noted, feedback always constructive. Support indeed for the Newton Abbot and Teignmouth Dementia Action Alliance. Following feedback from the group a few changes are already in place. Inevitably, however, some things are beyond our control – like parking restrictions. 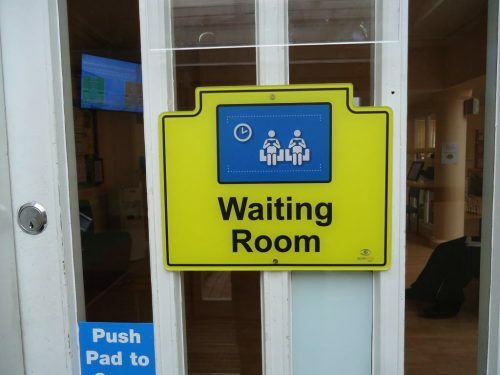 A new dementia friendly sign for the entrance to the waiting room. It helps to know the way back if you have visited the toilet. A dementia friendly toilet sign had already been installed. A contrasting toilet seat for improved visibility. Awkward door handle leading from the waiting room to the consulting rooms removed. We now have a simple, contrasting pull handle. Easy to see and use. Dementia Friends trained will wear their badges at work. Patients and carers can easily identify them. 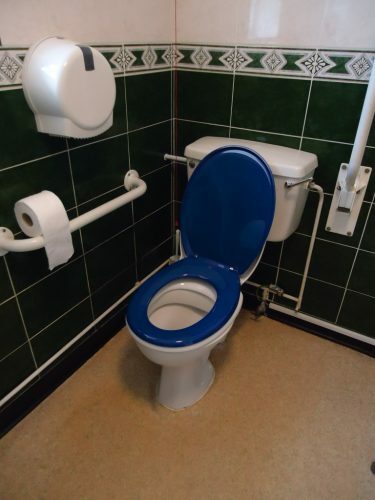 A contrasting toilet seat is more visible for people with dementia or poor eyesight. 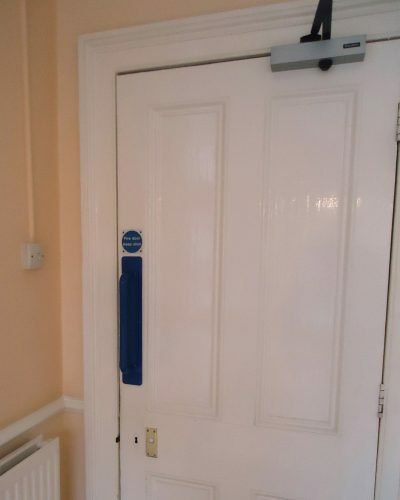 The door is now easier for all our patients to use. We encourage patients to give their views about how the Practice is doing. Our Patient Participation Group (PPG) is a great way to make sure these views are heard. Our PPG aims to build a patient communication forum for our surgery. As this is a Virtual Group, involvement is flexible and you can be as active as you like. We will email you, for information and opinions on particular subjects, a few times per year. You are then free to help organise healthy living campaigns, such as Awareness Walks and Support Schemes, according to your interest and skills. Membership of the PPG is open to any Devon Square registered patient. Identity and contact details will be kept confidential and not shared with other group members. The purpose of this group is not to deal with individual complaints, but to look at more general issues, e.g. appointments, waiting times, services etc.